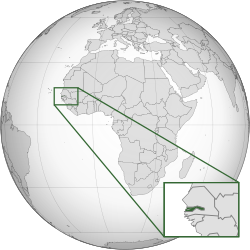 ↑ "The World Factbook: Gambia, The". CIA (English में). पहुँचतिथी 2018-01-02. ↑ 3.0 3.1 3.2 3.3 "The Gambia". International Monetary Fund. ↑ "2016 Human Development Report Summary" (PDF). United Nations Development Programme. 2016. पहुँचतिथी 21 मार्च 2017.